By all accounts, I want to hate this guy. This may come off as strange since I am a game developer who has long wanted the existence of an indie game scene and Jonathan Blow is an advocate of the little guy and experimental gameplay. And these are things I’ve never had a problem with. But I do begin to get irritated by the pretension that artists and their craft sometimes exude. 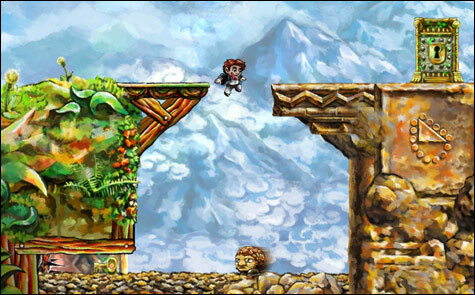 Here, of course, I am speaking of Braid, a simple Xbox Live Arcade platformer emulating (and parodying) Mario. An annoying art style was only the beginning. A time reversal mechanic garnered high praise and the critics lavished the indie title with near ridiculous support. Having never played Braid myself I am really just perturbed at the critical acclaim which is perhaps more an indictment of gaming media than the game itself. To point, I have to admit that I probably have been too hard on this game. Nevertheless, when it comes time for Braid creator Jonathan Blow to speak there is always a high-minded artsy slant to the coverage that encourages me to roll my eyes. But a recent gamasutra interview changed my tune. It’s easy for certain game advocates or “futurists” to ignore how self-important they sound and make broad statements about the industry and what it should be. While Blow definitely has his opinions on right and wrong I was surprised at his lack of absolutism. When asked pointed questions about the ethics of certain games, he prefaces with, “I don’t want to be in the business of saying that all games should be anything.” As a person who uses qualifiers for *almost* everything, this style resonates with me. It is less about being authoritative and more about personal opinion. Speaking with authority does not make one an authority. It’s not about designing something that’s going to be interesting or a positive experience in any way — it’s actually about designing something that’s a negative experience. It’s about “How do we make something that looks cute and that projects positivity” — but it actually makes people worry about it when they’re away from the computer and drains attention from their everyday life and brings them back into the game. Which previous genres of game never did. And it’s about, “How do we get players to exploit their friends in a mechanical way in order to progress?” And in that or exploiting their friends, they kind of turn them in to us and then we can monetize their relationships. And that’s all those games are, basically. What I appreciate is that I find his insight interesting while his tone is mostly balanced. Not that you’d imagine I favor these qualities after reading this blog.